Why did many early westerners prefer mules to horses as saddle animals? How do mules really compare to horses in terms of endurance, hardiness, surefootedness, longevity, and manageability? Why have mules fallen into relative disfavor today? If mules have greater endurance than horses, why do horses will most of today's equine endurance races? Why were oxen popular with last century's pioneers, and how did oxen compare with horses and mules? Is a mule a sensible alternative for a modern rider? THE MULE ALTERNATIVE is an honest and highly entertaining evaluation of the mule for anyone who has ever considered the animal as an alternative to a horse. 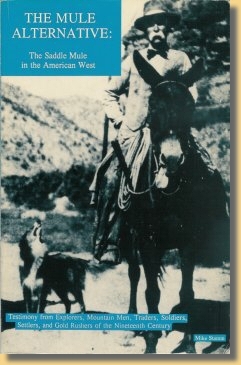 A must for anyone interested in livestock use in the Old West. Over One hundred and sixty pages; many archival photographs. I would like to extend special thanks to librarians Patricia Conger, Leola Liddiard, and Juanita Christiansen, who helped me obtain, through inter-library loan, many old and obscure books and journals; to Drew Ross of the University of Utah Libraries, who tracked down the photo for the cover of this book; to my friend Dr. Charles Kay, who largely introduced me to first-hand historical literature, and who is also a pretty good mule hand; to Dr. Nick Van Pelt who generously volunteered to review the manuscript (but who is, sadly, a horse owner); to Betsy Hutchins of the American Donkey and Mule Society for her encouragement and for her review of the manuscript; to Diane, for her help with numerous aspects of this project; and lastly, to several unbroken mules who taught me about being a human projectile. Orphaned at an early age by the deaths of his parents, Preston Nutter (1850-1936) was, at various times in his long life, a cabin boy on a Mississippi steamboat, a stableboy, a prospector, a freighter, a cowboy, a land speculator, a businessman, and a legislator. But from the time he went west with a government wagon train in 1863, his dream was to become a cattleman. In this ambition he succeeded wildly. In his heyday, Preston Nutter owned more land and more cattle than any other rancher in the intermountain West. In his later years, Nutter became something of a pioneer in range conservation. Preston Nutter was truly a self- made man. Photo courtesy of Special Collections Department, University of Utah Libraries.